Motorcycle Cargo Trailer – The simple how-to guide. I love discovering free information on the web that breaks down a complex process into easy to read, manageable steps. 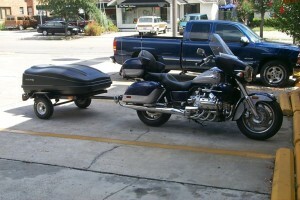 Like this Motorcycle Cargo Trailer made from a plastic minivan storage container, from Brian. 5 steps take you along as he makes the frame, assembles the pieces and puts it all together. 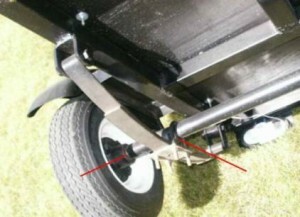 He does use a spring axle setup for this unit, shown below, to keep the cost down. 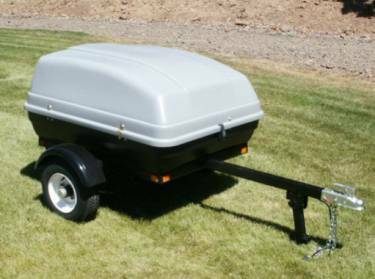 Lights, wheels, and storage compartment and you have got yourself a simple to build trailer. So he next time you want to go for a long trip, overnight haul, or just go exploring without a plan, you can bring along the gear you need to make that trip one to remember. 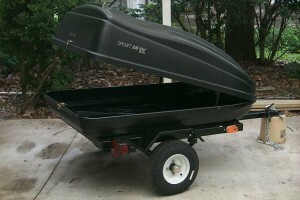 Check out the full process and parts list here at Brian’s Motorcycle Cargo Trailer Made Simple.